Building cleaning habits at young age and doing chores can be fun for children if make it as a part of the game. As parents we try to make our kids’ environment at home as clean as possible, have everything in order and organized from clothes, shoes, toys to books and other items. We also want to make sure that we use cleaners without harsh chemicals to create safe place for our family and kids. Recently Seventh Generation launched a new line of disinfecting cleaners including Disinfecting Multi-Surface Cleaner, Disinfecting Bathroom Cleaner and Disinfecting Wipes. These products made from botanically pure plant extracts feature CleanWell Inside™, a patented technology that kills 99.99 per cent of household germs on hard, non-porous surfaces. The CleanWell scientific team was one of the first to discover how to blend thyme to kill household germs botanically. As a result we have these fantastic cleaners available and designed to use in our homes. Seventh Generation Disinfecting Cleaners are Health Canada registered and are effective against Influenza A (common flu) virus as well as salmonella choleraesuis, staphylococcus aureus and escherichia (E) coli bacteria. They do not only clean and deodorize, but also disinfect with no rinsing/wiping requires (simply spray the surface and leave for 10 minutes to air-dry). I received to try out three disinfecting cleaners from new line with Lemongrass Citrus scent. Bathrooms become shiny after using Disinfecting Bathroom Cleaner and I sometimes do not even put on cleaning gloves. I also like the smell - clean and fresh. Disinfecting Multi-Surface Cleaner is doing good job on different surfaces like plastic, metal or wood. We use it to clean tables and chairs. Crayons and play dough often sticks to unusual places, our kid always finds creative ways to mess up the whole house in minutes. Disinfecting Wipes are our savers for any occasion, from mini-accidents to wiping door handles, umbrellas, containers, phones and other small items which cannot be washed. During cleaning routine we make sure our kid helps us. 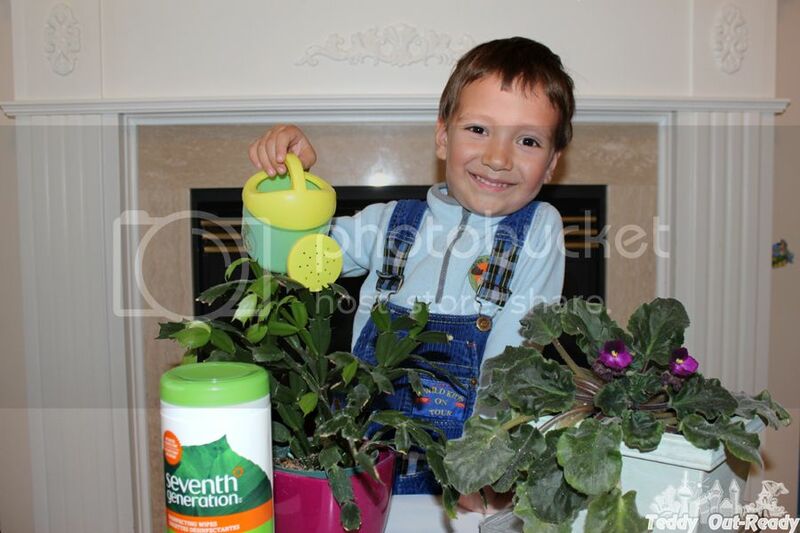 Seventh Generation came out with a helpful list of age appropriate chores for kids, check it out. For Teddy we picked - Ages 4-5: fill pet’s water/food bowls (with supervision), water plants, and clear the dinner table. I see that he is eager to learn how to be good at cleaning but still cannot involve him into cleaning his toys every day. 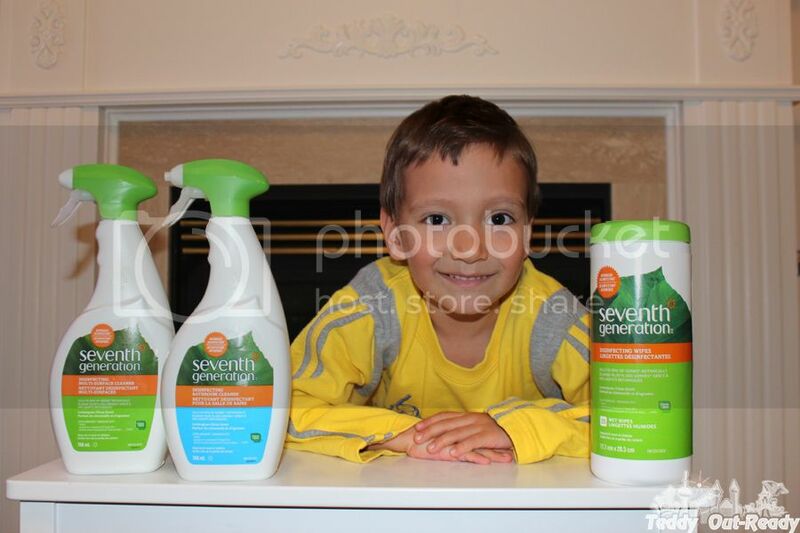 Overall, we like Seventh Generation new line of disinfecting cleaners,. With upcoming cold and flu season these products are more than welcome to help families to kill household germs, clean and deodorize. Family health starts from home and at early age, cleaning habits along with safe, toxin-free cleaners make our life better and greener which is good for us and the environment.